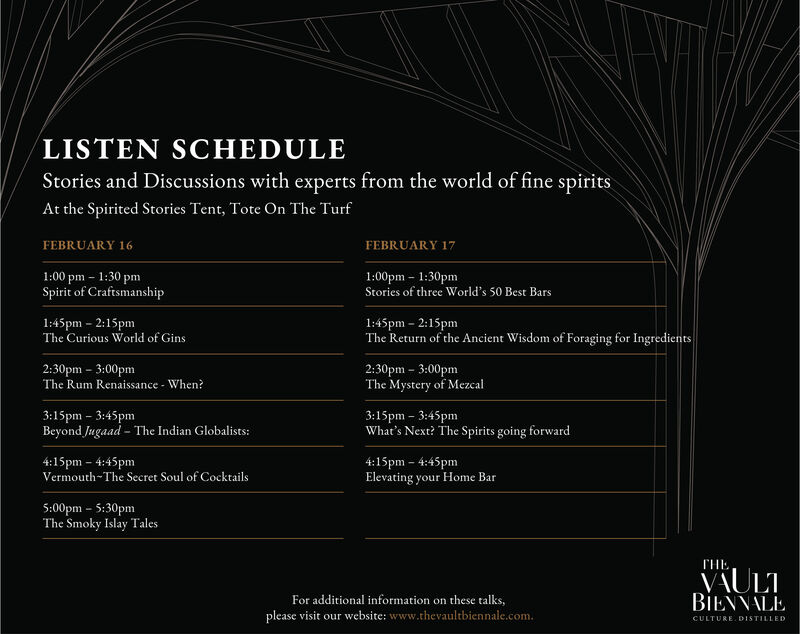 The Vault Biennale, a highly curated Luxury beverages festival launches its first edition in Mumbai on February 16th & 17th, 2019, with the central theme - `SPIRITED STORIES’. The Vault Biennale Team invites you to come and engage your senses in the four highly curated experiences – Handcrafted & Handpicked. LISTEN – to curated storytellers from the world of fine spirits. The Vault Biennale will be held on February 16 and 17, 2019 from 12:00pm-7:00pm. The last pour for tasting on both the days will be at 6:30 pm, and the show ends at 7pm. The Vault Biennale will be held at Tote On The Turf, Mahalaxmi, Mumbai. Tote on the Turf, designed by Kapil Gupta, one of India’s leading young architects, is set amidst a lush canopy of 100-year old rain trees with a stunning backdrop of historic buildings and the green of Mumbai’s Mahalaxmi Race Course. Integrating cutting-edge design techniques with traditional elements, Tote is an award-winning venture in architecture, design and hospitality. A pulsating urban playground where Bombayites come together to meet and mingle. The Bar Take Overs will be held at the legendary Kamala Mills. Additional details to be announced soon! WHO SHOULD I CONTACT WITH PRESS INQUIRIES? All press inquiries should be directed to The Vault Biennale: [email protected]. WHAT DOES THE DAY PASS GIVE ACCESS TO, AND WHAT IS EXTRA? Included: The Day Pass allows you access to the TASTE section (which has over 40 handcrafted beverages to taste) and LISTEN to section (where experts from across the world share their stories). You will also receive 3 coupons with your Day Pass for the DISCOVER section which has over 15 expressions launched in India for the first time. You can choose any 3 expressions in this section (using the 3 coupons) to sip and savor. Extra: INDULGE Section: You need to buy additional tickets on Book My Show for the INDULGE SECTION where you will get to immerse in ‘Masterclasses and Mixology’ experiences. Seating is limited as the intention is to create a very intimate experience. So please book your tickets early to not be disappointed. We will be announcing bookings for this soon, so do track Book My Show for details. ADDITIONAL COUPONS FOR DISCOVER: Since each Day Pass gives you access to coupons for DISCOVER section (to choose from the 15+ new expressions), in case you wish to discover more expressions, there will be tasting coupons at the venue, that can be purchased on-the-spot to explore more. All tickets are non-refundable. Please see our Terms and Conditions for all information on purchasing tickets. DO I NEED ADDITIONAL VOUCHERS for the TASTE section? No, once you're in the TASTE section, you are free to taste any of the beverages in that area. However, as the word `TASTE’ indicates, we would like you to taste the beverages, and excessive pours will not be encouraged to avoid any unpleasant behavior. FOR WHICH SECTIONS DO WE NEED TO BUY ADDITIONAL TICKETS? 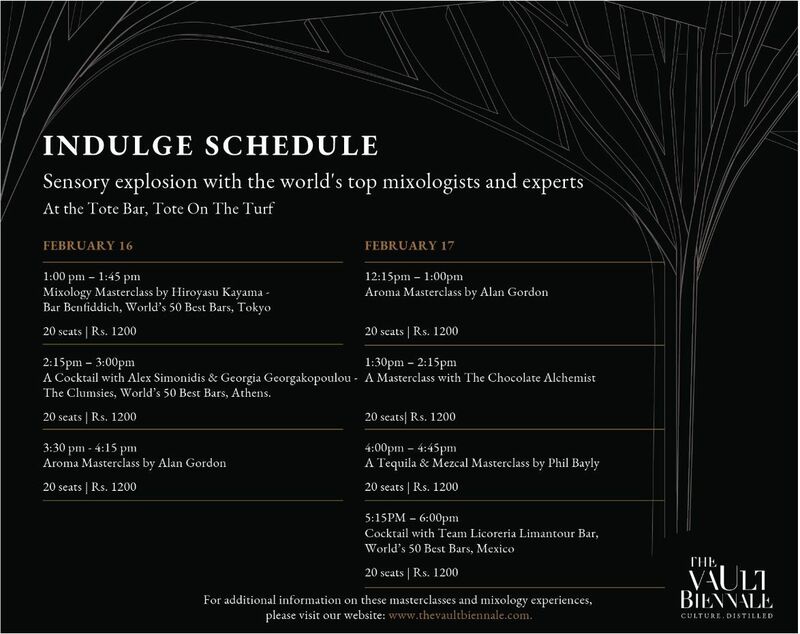 You need to be buy additional tickets for the Indulge Section Masterclasses and Mixology experiences on Book My Show. Seating is limited for these very popular tastings, so book early and don't be disappointed. 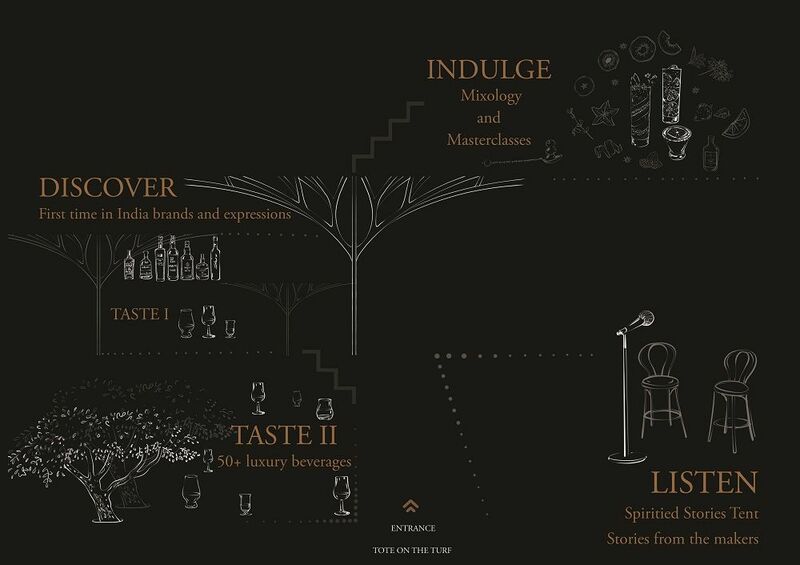 Each attendee receives 3 tasting coupons that allows them to choose, sip and savor expressions at The First Time In India Bar. Additional tasting coupons can be purchased from the ticketing counter at the Biennale. DO I NEED ADDITIONAL VOUCHERS TO TASTE SPIRITS IN THE TASTE SECTION? No, once you're in the Taste section, you are free to taste any of the spirits. However, excessive drinking and intoxication is not recommended. IS THE CULTURE.DISTILLED, STORYTELLING SECTION OPEN TO ALL? DO WE NEED ADDITIONAL BOOKINGS OR TICKETS? The Culture. Distilled section is open to all and there are no pre-bookings required. WOULD I BE ALLOWED INCASE I AM LATE FOR THE SHOW? Yes, a day pass holder for that day can enter anytime between 12pm to 6:00pm. However, for the masterclasses & mixology, the guest needs to report on time for the slot he/she has purchased the ticket, as we will be starting each class on time, and you will miss out on the experience accordingly. Re-entry is allowed in the Taste (Hall 1&2), Discover (The First Time In India Bar) and Listen (Spirit Stories Tent) sections only. IS THERE PARKING AVAILABLE NEAR THE EVENT SPACE? There is plenty of parking available inside the race course compound where the venue is located. IF I FEEL I CANNOT DRIVE AFTER THE EVENT WILL THERE BE A TAXI SERVICE TO TAKE ME HOME? If after The Vault Biennale you feel you are unable to get home safely, we recommend you avail Uber and Ola services. Taxis will be available to call as well. Please do not drive intoxicated! CAN I BRING A CAMERA OR A VIDEO CAMERA TO THE VAULT BIENNALE? Sure! In fact, we would encourage you to take as many photos and videos as you please, and we hope that you will be generous enough to share them with us. Please feel free to tag your posts with #thevaultbiennale on Facebook and Instagram. WILL THERE BE ANY RARE AND ULTRA PREMIUM BEVERAGES AT THE EVENT? Absolutely. The entire beverages list is available on our website – www.thevaultbiennale.com. WILL THERE BE ANYTHING TO EAT OR DRINK AT THE VAULT BIENNALE OTHER THAN FINE SPIRITS? There will be plenty of water available at the venue. You can order and eat from the variety of delicacies offered by the Neel or choose and buy some quick bites curated by The Neel specially for the Biennale. You may purchase tickets on Book My Show. CAN I BOOK THE TICKETS ON THE DAY OF THE EVENT? Yes, tickets can be booked on the day of the event. At midnight, all remaining tickets for the following day’s events are taken offline but tickets may still be purchased by contacting the event provider directly. It is advisable to check for availability in advance. Sorry, no children. All attendees must be 25-yrs or older. Everyone will need a government issued valid ID to enter the festival. MAY I BRING A BACKPACK WITH ME? Backpacks, briefcases, tote bags and the likes are not allowed at The Vault Biennale. We love our animals, but no pets will be allowed at The Vault Biennale. DO I NEED TO BRING MY OWN GLASS? No, there will be glassware provided at the event. Entry to the event commences at 12:00 pm and ends at 6:30pm. The last pour will be at 6.30 pm. The Masterclass and Mixology experiences are at an additional cost. Please select and book your slots. Apart from the day pass and masterclass and mixology experience tickets, internet handling fee per ticket may be levied. Please check your total amount before payment. This ticket admits only one person and shall be produced to exchange for a wristband. Every ticket holder needs to furbish a government issued id at the venue as age and identity proof. Access to the show is subject to presentation of a valid form of proof of identity. In any event, the Organizer reserves the right to refuse access to The Vault Biennale to any person that it considers does not meet the access criteria or may disrupt the event. Any person refused access to The Vault Biennale will be entitled to a refund of the price of their ticket. Wristbands are non-transferable and must be worn at all times during the event. Wristbands removed or misplaced shall not be reissued under any circumstances. Any person found to be attending the event without a valid wristband and ticket shall not be permitted. Tickets once purchased shall not be refundable whatsoever. Each individual will be given only 3 coupons to avail 3 spirits at The First Time In India Bar. Additional coupons can be purchased at the venue, subject to availability. Tickets shall be valid only if purchased through official agents. Tickets purchased through unauthorized agents shall not be valid and entry shall be denied to the event. The person below the age of 25 years shall be denied entry to the event. There shall be no re-entry to the Indulge section at the venue. It is mandatory to furbish the additional tickets purchased for the masterclasses and mixology experiences while entering the Tote Bar. The organizer will not be responsible for any such loss and reserves the right to refuse access. The attendees need to arrive sharp at the time and take their seats for the Masterclass and Mixology experiences. Late arrivals will not be allowed to enter the Tote Bar and there will be no refund offered in such scenarios. To ensure that all the guests of The Vault Biennale receive the benefit of the most elite fine spirits experience possible, The Vault Fine Spirits Pvt. Ltd. requires that all attendees conduct themselves with etiquette and decorum in accordance with our guidelines. All attendees of events hosted by The Vault Fine Spirits Pvt. Ltd. agree to abide by the following Show Conduct Guidelines. The Vault Biennale is an exclusive, privileged event with the sole purpose of the enjoyment of fine spirits through taste, sampling and education. Excess is unacceptable. The Organizers promote moderate consumption, seeking quality over quantity as a preventative measure. The Organizers always advocate a responsible approach. The Organisers strongly advocate – Do Not Drink and Drive policy and encourage the attendees to not violate road safety rules or endangering your lives drinking and driving. The lineup of talks, masterclasses and mixology experience and spirits for the show is subject to availability and may change. Participants may not be notified of this change. Visitors who are visibly inebriated or behave in any disruptive or offensive manner will be escorted from event venue. Attendees are strongly encouraged to eat before and during tasting events. The visitors can avail to the food services at The Neel restaurant at an additional cost. Cigarette smoking and vaping is strictly not allowed at the venue. Carrying and consumption of banned articles, substances including bottled water, alcohol, and outside food shall not be permitted at the event. The Vault Biennale is a drug-free event. Consumption and possession of any form of intoxicants will result in removal of the person consuming/carrying the same from the event and shall be handed over to the concerned authorities. The organizers are not liable for any food/beverage liability claims. Under no circumstances, any person attending the event shall possess in any form/place any object/weapon that may have the potential to cause any bodily injury. No person attending the event shall in any manner vandalize/cause damage to any location/part of the event. The event shall be subject to necessary security procedures. The organizers deem fit and which shall include checking of personal belonging and body frisking. Purchase of tickets to this event confirms adherence to this policy. Guests who refuse to comply with this safety procedure will be denied entry. Dress code is smart casuals. Ticket Purchaser authorises BookMyShow to disclose their personal information collected by the Site with the Event Host (The Vault Fine Spirits Pvt. Ltd.) responsible for The Vault Biennale. Ticket Purchaser authorises The Vault Fine Spirits Pvt. Ltd. to use their personal information to contact them, in relation to The Vault Biennale for which they have purchased a ticket, and for future promotional and marketing purposes. The event shall at all times be subject to Force Majeure events and for which the organizers shall not be responsible for in any manner whatsoever including without any limitation to its postponement. In case of postponement, there will be no refund offered. The listen schedule is subject to change. The organizers shall be recording the event through a variety of AV means and which it may also telecast in the media. Persons attending the event hereby extend the consent to such recordings/telecast. Only vendors authorized by the organizers shall be permitted to advertise/trade their goods/services at the event. The organizers shall not be responsible for any theft/loss, harm, an injury that may be caused to any person at the event in any manner. The organizers shall in no manner be responsible for any theft/damage caused to their vehicles parked in the designated area. The organizers reserve the exclusive rights to decline entry to any person in breach of any terms and conditions of the event with or without refund of the ticket price. Areas of the festival are built to capacity. Organizers reserve the rights to hold an entry to certain areas within the venue to ensure a safe experience. Persons attending the event shall abide by all the instructions of the organizers. Cost of the ticket is inclusive of 18% GST.